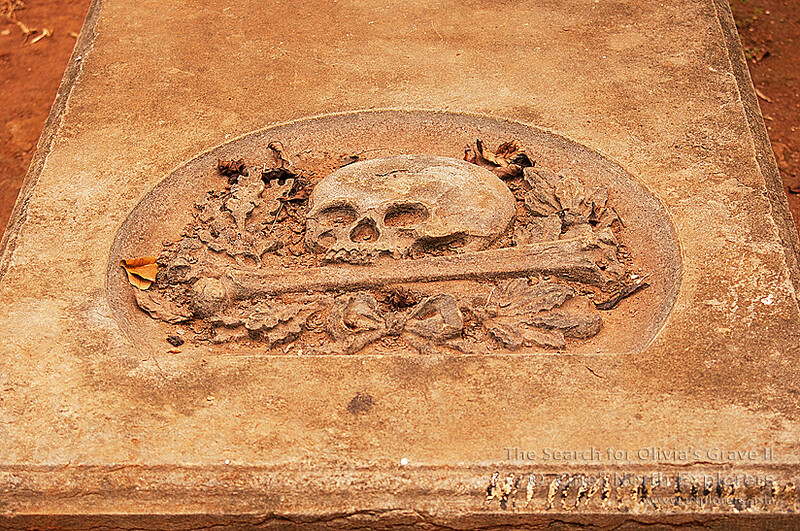 Singapore based Urban Explorers | One-North Explorers: The Search for Olivia's Tomb Continues.. The Search for Olivia's Tomb Continues..
As the car zipped along seemingly endless rows of dusty alleyways, I looked out of the window at the crowds of people sauntering along the streets of Jakarta. Street photography could have been much more gratifying if not for all the trash along the street. It seems that the only way for denizens to get rid of trash is to collect it and throw it onto a smoldering fire. I lost count of the innumerable burning pits of trash as we headed towards the second cemetery. Jakarta is a bustling megalopolis abounding with people from all over the country. Many of the poorer folk from other parts of Indonesia have chosen to come to the capital in search of a better life in the city over the sweat and toil of the agricultural lifestyle they have back home. Sadly, only a handful truly find sustainable jobs, while the majority who are overlooked turn to other ways to support their livelihood. You can often see street peddlers hawking anything and everything from dubious-looking bottled water, mangoes to woodcraft and even toys and magazines at major traffic junctions. It also is not uncommon to find street urchins who plant themselves at busy uncontrolled junctions, attempting to controlling traffic with hand gestures and whistles in return for a token amount. Many motorists do not give money to these hoodlums, those who do simply throw coins or notes in small denominations out of their window. Many times, I've also been serenaded by scruffy kids brandishing an out of tune ukelele while my taxi stood still the rush hour traffic gridlock. More often than not, I wind down my window a little and pass them some money, much to the chagrin of the taxi driver. Poverty is a big problem in this city. The former city hall of Batavia, the Stadhuis was built in 1710 and was the administrative centre for the VOC (Dutch East India Company) and later the Dutch Colonial Government. The words "GOUVERNEURSKANTOOR", which mean Governor's Office, can be seen inscribed on its facade. Today the impressive colonial building houses the Jakarta History Museum. The Dutch word "Kantoor" has also been assimilated into the Bahasa Indonesia as Kantor, meaning office, along with several other loanwords such as Wortel (Carrot) and Halte (Stop). Back in the days of Dutch rule, the colonial exploitation of Indonesia's wealth of resources had in turn contributed to the industrialisation of the Netherlands. The Dutch introduced coffee, tea, cacao, tobacco and rubber to the Dutch East Indies and large expanses of Java were turned into plantations which were cultivated by Javanese peasants, collected by Chinese intermediaries, and sold on overseas markets by European merchants. Before World War II, the Dutch East Indies was producing most of the world's supply of quinine and pepper, over a third of its rubber, a quarter of its coconut-based products, and a fifth of its tea, sugar, coffee, and oil. The handsome profit made from the Dutch East Indies made the Netherlands one of the world's most significant colonial powers. "Kita sudah sampai, Pak" (Sir, we've arrived) said the driver as he pulled over along an empty looking street, breaking my train of thought. A marble signboard adorned with bronze lettering identified the place as the "Museum Taman Prasasti" or loosely translated as the Museum of Inscriptions. The name was chosen probably due to the inscriptions on the many tombstones that lay beyond its gates. A weathered bronze cannon stood in front of the sign, pointing in the direction of the road that ran adjacent to the cemetery. A glimpse of Batavia's colonial past, perhaps? This had to be the place, I thought to myself. I looked to my left and a grand looking portico, adorned with beautiful columns on both sides, greeted my sight. There was an iron gate guarding the entrance, and beyond that gate, I could make out more than a handful of headstones plastered on standing columns in an open space. of the dilapidated old sacred temple of Batavia. In the mid 19th century, the majority of the Dutch people in both the Netherlands and their colonies were staunch Roman Catholics. Displayed above the entrance to a cemetery which was predominantly Dutch, it made some sense that the sign was inscribed in Latin. It also prompted me to dig deeper into the history of the cemetery. Taman Prasasti was first established as the 5.5 hectare Kerkhoflaan (Cemetery Lane in Dutch) in 1795 and the locals called it Kebun Jahe Kober. One of the oldest cemeteries in this part of the world, it was built following a massive disease outbreak which killed many in Batavia. Apart from this, Kerkhoflaan was meant to supplement the cemeteries of the De Nieuw Hollandsche Kerk (The New Holland Church, which presently houses the Wayang Museum) located in the Stadhuisplein (City Hall Square), and the De Nieuwe Potugeesche Buitenkerk (now the Zion church) located in the southeastern part of Batavia. Both cemeteries had been filled up and the Dutch Government had to look for an alternate burial ground in anticipation of the rapid growth of the Dutch population in Batavia. A rouwbord or mourning shield was a common Dutch practice. It displayed the lifetime achievements of the deceased and was hung over the door of the deceased's house and later on the wall of the church where he or she was buried. Kerkhoflaan's location was chosen after much consideration, and it is strategically placed due to its proximity to the Kali Krukut river. In the olden days, the dead were - along with the grieving family and friends - transported in small boats from the Binnen Hospital (present day Bank of Indonesia Museum) in the north along the Kali Krukut and travelled down south to Kerkhoflaan, where the hearse would be transferred onto dry land to a horse-drawn carriage at the present location of the Ministry of Communications and Informatics. The hearse would travel a short distance on road to Kerkhoflaan for the final rites before the body is finally buried at the cemetery. Kerkhoflaan was the burial ground for Dutch nobles and several high ranking officials of the VOC (Vereenigde Oostindische Compagnie - Dutch East India Company) where they were laid to rest by their families and relatives. The general public were allowed to buried there much later but a certain fee had to be paid. Following its proclaimation of independence from the Netherlands in 1945, the Indonesian Government sealed off the cemetery in 1975 as it had ran out of space. Morbid, but that's how we all end up one day. During this time, all the bodies buried underneath the cemetery were either moved to other cemeteries (i.e the cemetery in Menteng Pulo) or brought back to the Netherlands by their living relatives, leaving the tombstones behind. The original cemetery was also shrunk into a 1.3 hectare site as part of the new Central Jakarta Mayor's office was built on the former cemetery grounds. The cemetery was reopened to the public as a museum on 9 July 1977 by the then-Governor of Jakarta, Ali Sadikin. A plaque is displayed on a small monolith located near to the entrance to commemorate this move by the Government. The monolith at Taman Prasasti bearing Governor Ali Sadikin's message and signature. The main building which I was standing in was built in 1844 with a doric column order favoured by the Dorians, one of two Greek races. It was known as the Balairung Building and it had two wings on either side which functioned as ceremonial halls for the final rites before the burial was carried out. The hall on the right wing was used for female bodies, while the other one on the left was used for male bodies. The pillars at the entrance are all numbered and arranged neatly. To the left of the tombstone pillars, i noticed a peculiar sight. There was a bell sitting atop a metal pole and the bell was attached to a rope, which visitors could pull. However, I think not many would know that this bell was in fact used in the past by the cemetery workers to inform all the staff that a new body had just arrived. A worker, upon sighting the arrival of the hearse, would ring the bell by pulling the rope and all the staff would prepare the necessary items for the final rites in the respective wing of the Balairung Building. I'm pretty sure that the many visitors who rang the bell in jest would be shocked to find out the real purpose of this "death bell". The "death bell" of Taman Prasasti. Think twice before you pull that rope. I moved further inward, eager to locate Olivia Raffles' tomb. However, as I looked around, i realized that the cemetery was more complicated than I had expected. I was hoping to see tombs arranged in neat grass lawns with a couple of odd-shaped tombs like the ones in Petamburan. That would have made my search much easier. However, this was not to be. Taman Prasasti was a sprawling cemetery park with tombs that were haphazardly placed. There were tombs of different shapes and sizes everywhere. I did not know where to start. It was a total nightmare. 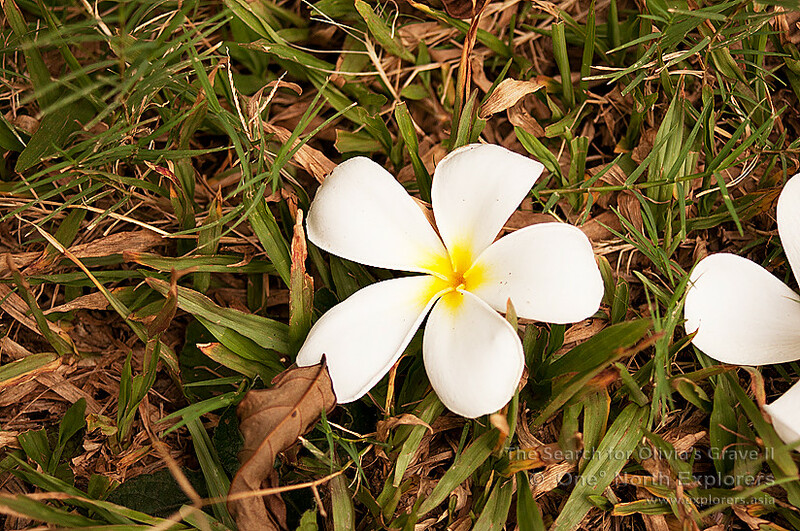 Fallen frangipani flowers, commonly associated with the Pontianak, can be found in abundance near to the entrance. There are no "fatimah rockers" to be found here though. Going by my instinct, I decided to move in a clockwise direction to comb the area. As soon as I set off on my search, a distinctive grave with a distinctive cover caught my eye almost immediately. The grave cover took the form of a sad lady lying on the ground with her head buried in her hands, depicting the poignant moment of a loved one departing from this world. I like to call this lady the Weeping Beauty. Apparently this is a very well-known grave with a back-story to the statue of the Weeping Beauty. It is said that the grave was build to illustrate the pain of a newly-wedded lady whose husband succumbed to malaria. Unable to take the pain, the lady committed suicide. Unfortunately, there were no inscriptions on the grave to give any clues to the Weeping Beauty's true identity. A stone's throw away from the Weeping Beauty, an open book carved out of stone lies atop the grave of Dr. H.F. Roll. Dr. Roll was the founder and director of the STOVIA medical school, which evolved into the Faculty of Medicine in the University of Indonesia today. In 1851, the Dutch colonial government decided to establish a school to train native medical assistants. The training for each person lasted for two years and graduates were certified to provide simple and basic medical treatments. The degree conferred to the graduates was Dokter Djawa or "Javanese Doctor" as they were certified to only practice medicine in the Dutch East Indies, especially so on the island of Java. Soon, the program became more comprehensive and by 1875, the program had reached 7 years in length. Graduates were entitled to the more established degree of Medical Doctor. Then, the quantum leap came in 1898, when the government established a entirely new medical school named STOVIA to train medical doctors. STOVIA stood for the School Tot Opleiding Van Inlandsche Artsen or "Training School for Native Doctors" located in the Hospitaalweg (literally Hospital Road) in Batavia. Many STOVIA graduates later played important roles during Indonesia's national movement towards their proclaimation of independence, as well as in developing medical education in Indonesia as a whole. Dr Roll can be seen conducting a lecture to a group of native doctor trainees in this old photo taken in 1902 (link) where he is seated on the left. He can also be seen seated in the middle of this photo of the staff members of STOVIA (link). True to his roots, the stone book on Dr. Roll's grave illustrates his wisdom and relentless pursuit of medical academic excellence when he still was alive. I'm guessing that this was probably Dr. Roll's son, seeing that they share the same surname. There is not much information about Frits Roll, except that he was a medical student and died before his 20th birthday. A chip off the old block, perhaps? CONSCIA MENS RECTI FAMÆ MENDACIA RIDET. A clear conscience triumphs over false lies. Ovid was an early Roman poet who lived during the reign of Augustus, the first emperor of Rome. This quote was taken from the fourth book of Ovid's Fasti, a six book collection of Latin elegiac poems. The broken jar you see in the picture above used to decorate the foot of the grave. However, it's a pity to see that it has been broken into two pieces probably through the work of some vandal. As this was a cemetery for the Dutch and other Europeans, I was most surprised to see a Japanese tomb as I continued my stroll. As I approached the tombstone, I was greeted by a headstone inscribed in Kanji. The tombstone was in fact a monument for the 30 brave Japanese soldiers from Shibata City, Niigata Prefacture, who fought for the 19th Company, 16th Battalion, 2nd Division of the Imperial Japanese Army. The entire company perished in the Ciantung River in Bogor in 1942 when the Japanese invaded the Dutch East Indies. The Japanese people who live in Jakarta come to this monument twice a year to perform a ceremonial ritual as a mark of respect for the deceased. The ranks and names of the deceased are engraved on a stone plaque below the tombstone. Back in the days when the Kali Krukut river was still used to transport dead bodies from the Binnen Hospital, the horse-drawn hearse carriage was commonly used to transfer the bodies from the river bank to the Balairung Building in preparation for the burial. The wealth and social status of the deceased is often reflected in the number of horses pulling the carriage into the cemetery. The more wealthier or famous a person was, the more horses would be pulling their hearse. As the hearse carriage made its way to the gates of Kerkhoflaan, a cemetery worker would ring the bell to inform everyone of its arrival. The funeral administrators would prepare themselves when they heard the bell ringing, and the person ringing the bell would continue until the hearse arrived at the gate proper. Today, a replica of the hearse carriage is displayed in a display shed located at a corner of Taman Prasasti. on this replica to prevent the public from climbing inside the carriage. A ramp to help the carriage up to its display shed. There is a particular tomb which is believed to have the power to grant prosperity, happiness and fertility to those who visit it. The occupant of this seemingly supernatural grave goes by the name Kapiten Jas (Captain Jas). However, the identity of the person who was buried there remains a true mystery. The tomb is well-known for having a strong fragrance of burning incense surrounding it even though there evidently wasn't any incense that was being offered in the area. When I first stumbled upon the tomb of Captain Jas, I initially thought it was a storage area for "lost and found" items in the cemetery. Imagine my shock when I read the stone inscription and realised that I had found his "tomb". I didn't catch a whiff of the "infamous" incense smell though, and the air remained odorless the whole time I was there. Wrong time, maybe? It was also pretty unusual to see that a tree has grown on top of a part of the grave. From this inscription, it seems that many of those who visit this grave actually place a huge amount of true faith in Captain Jas's powers. The words chosen for the inscription depicts just how much "Father Jas" is believed to be a vassal of God and one who was able to send messages on behalf of the believer. The name Kapiten Jas can be traced back to the Jassenkerk, a Portuguese church which was located near to the cemetery. In the mid 1600s, many people were buried in a cemetery near the guardhouse located on the eastern side of the Jassen Bridge, a wooden drawbridge which ran across a tributary of the Ciliwung River. This tributary was an important part of southern Batavia's infrastructure as it helped to direct excess water into the Stadsbuitengracht, a large open drainage canal located outside the city walls. In 1676, a Roman Catholic church, built completely out of bamboo, was erected near to the cemetery. Due to its proximity to the Jassen Bridge, it was simply named the Jassenkerk (Jassen Church) and the cemetery was assimilated into the churchyard. The whole "Captain Jas" fiasco is believed to be a simple figure of speech where people described death and burial as "naar het land Jackets Captain von gaan" or "going to the land of Captain Jas". Later on, some of the bodies buried in the Jassenkerk churchyard were relocated to Kerkhoflaan. Therefore, it is widely believed that the headstone bearing the name of Captain Jas in Taman Prasasti was really just a memorial of the Jassenkerk churchyard itself, and that this imaginary person - Captain Jas - did not really exist, nor was anyone really buried beneath the headstone. The accounts of people who claim to have the strange olfactory experience with the supernatural smell of burning incense around the grave can probably relate it to the use of incense during worship in the Jassenkerk when it was still around. The bamboo church has since been removed and replaced by the Zion Church. In another version of the legend of Captain Jas, it is said that a strange incident happened when this grave was dug. The workers found that coffin that was so tightly intertwined with the roots of the tree growing beside it, it was impossible to remove the coffin. The word soon spread like wildfire and many people began to visit this strange grave. Many who visited the grave claimed that they experienced a big change in their lives. Those who were poor became significantly wealthier, while childless couples also managed to conceive successfully after visiting the grave. Both versions of Captain Jas's legend seem to conflict each other. One version states that he does not exist, while the other involves the discovery of his coffin below the grave. However, despite this cloud of uncertainty which surrounds the legend of Captain Jas, many still flock to the tomb, eager to seek fertility, safety, prosperity or happiness. This is a true mystery which remains to be solved. Could this be Olivia's tomb? As I continued walking along the pathway, I noticed a large tomb near to Captain Jas's grave. The grave was resting on top of a octagonal staircase and it was surrounded by 8 short columns. The first thing that struck me was the black staircase and white columns. This colour scheme was much akin to the British colonial "black & white" Tudor houses that we have in Singapore. Could this be Olivia Mariamne Raffles' tomb? I climbed up the steps eagerly, wanting to read the inscription atop the grave to confirm my assumption. However, the inscriptions on the tombstone itself had been badly weathered and it would be a real challenge to read the inscriptions without smearing some chalk onto the tombstone. However, not only did I not have any chalk with me, I did not think it would be very nice to start applying chalk over all the tombs which I simply assumed belonged to Lady Raffles! The top of the gravestone may have faded with time, but i could still make out the faint inscription on it. BINGO! The sweat, mosquito bites and fatigue was worth it. This tomb here is an important piece of history not only to the Javanese people, but also to us as Raffles went on from Java to found Singapore. Any tiredness I had felt before had instantaneously disappeared. Here it was, right before my eyes, a fragment of our colonial past. I went around the tomb with renewed vigour, snapping away as I circled the majestic final resting place of Olivia Mariamne Raffles. Thoughts filled up my mind. What if Olivia Raffles did not fall victim to her illness during her stay in Java? What if she had followed Raffles to Singapore? What changes would she have implemented as the First Lady of the founder of Singapore? So many what-ifs popped into my mind. It was simply fascinating. On the front of the tomb, there was a small plate which was added much later (probably by the curator) to help identify the tomb as well. I found the inscription amusing as the words "Keterangan: Bentuk Kijing" on the plate actually meant "Description: The Shape of a Gravestone". It also depicts the year that the grave was completed (1814), the inventory number (probably as a record for the museum) and most importantly the name of the grave's occupant. While setting up my tripod for this shot below, I noticed that the Central Jakarta Mayor's office was the backdrop of my photo. 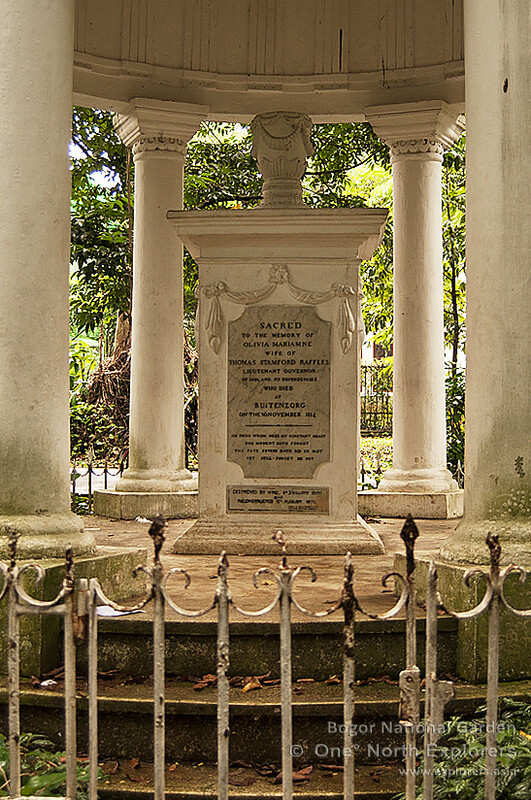 Olivia Mariamne Raffles' tomb was one of the closest ones in proximity to the Mayor's office. Since this newer building was built over what was originally part the former cemetery grounds, the cemetery's boundary would have extended far beyond the reaches of the Mayor's Office. You may compare Olivia Mariamne Raffles's grave with the memorial Sir Stamford Raffles built for her in near the Lieutenant-Governor's palace in Buitenzorg (present-day Kebun Raya Bogor) below. You may click to enlarge the photos or view the full set here. There was boisterous singing and clapping coming from a group of people who were dressed in similar clothing within the grounds of the mayor's office, breaking the silence in the cemetery. A group of government servants having some sort of team-building activity, maybe? I stood back and looked at the eight short columns surrounding the tomb. Although they look like they were built to symbolize the cardinal points of the compass, these columns were actually part of a Dutch church.When the church was deemed too old and unsafe to be used anymore, the stone from the church was reused to decorate the tomb of Olivia Mariamne Raffles. The eight columns, which used to support the old church's roof, were then shortened and placed around the tomb as an ornament. The tomb of John Casper Leyden, the Scottish writer, doctor, poet and brilliant oriental linguist who was a close friend of the Raffleses, lies in close proximity to Olivia Raffles's tomb as well. John Leyden and Olivia Raffles had often exchanged letters and poetry with each other and he was well known to be a bosom friend of Sir Stamford Raffles and a confidant of the couple. The two had met when Leyden, who left British India after spending two years there studying the mystic eastern languages of Hindustani, Tamil, Sanskrit, Malay among others, set sail for Malaya in 1805 where he befriended a young Stamford Raffles on Prince of Wales Island (Pulau Penang). Raffles was the assistant secretary to the Governor of Penang, Philip Dundas, at that time. In 1811, Leyden joined Lord Minto in the expedition to Java. Leyden fell to the infamous Batavian Fever (an epidemic at that time, it was possibly malaria or dengue) after entering a library (which was said to have contained many Eastern manuscripts) without having the place properly aired first. After three days of illness, he died on 28 August 1811. 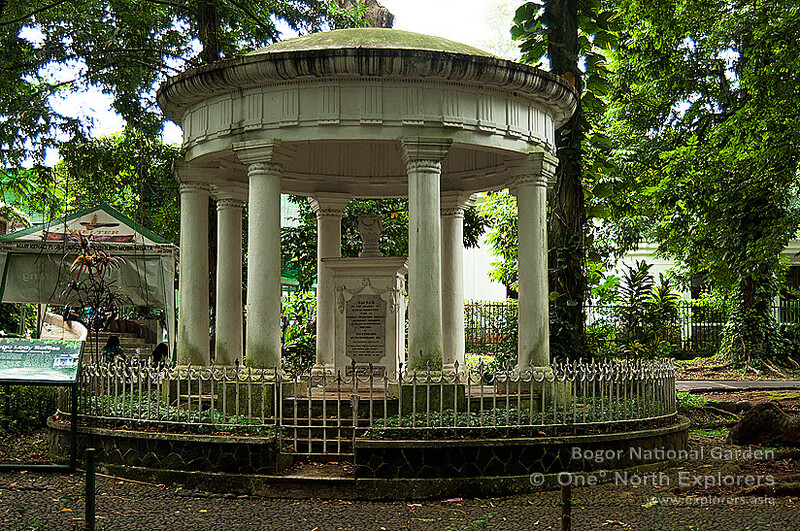 While Olivia Raffles's tomb may be of more significance to us, there are many more interesting tombs around Taman Prasasti which are worth taking a look at. Although my little mission was complete, I was determined to seek out more unusual tombs for photo opportunities in the area. Standing like a grand monument, the tomb of Dirk Anthonius Varkevisser towers over the tombs in the vicinity. Dirk Anthonius Varkevisser, an official of the Dutch East Indies government, was born in Samarang (present-day Semarang in Central Java) on 11th July 1800 and passed away on 4th January 1857 in Batavia. He was the former Dutch resident of Pasuruan (in east Java, near to the city of Surabaya), and he was also knighted and conferred the Order of the Netherlands Lion, a Dutch order awarded to eminent individuals from all walks of life, including generals, ministers, mayors, leading scientists, industrialists and high ranking civil servants, among others. A high-relief set of agricultural tools is prominently displayed on the front face of Dirk Varkevisser's tomb, among them a winnow fan used in wind winnowing, scythes and sickles for harvesting crops, a spade for digging the earth and many other assorted tools used for farming and soil cultivation. This is because as the Dutch Resident of Pasuruan, Varkevisser oversaw the cultivation of many cash crops, which included the highly profitable sugar cane, and he was also in charge of the production of sugar. These crops, which were significantly cheaper to cultivate in Java, were then transported back to the Netherlands in large ships to meet the demand of the Dutch population back home. The sculptural monument of Varkevisser's tombstone is a simply stunning piece of art which has been well preserved since 1857 until the present day, a hefty feat considering that the tomb is almost a century and a half old. This unique mausoleum, which is shaped like a small house, was a family tomb for the wealthy bourgeoisie van Delben family. The head of the van Delben family was Ambrosius Johannes Wilbrordus van Delben. During the transformation of the cemetery into the Taman Prasasti Museum, the mausoleum was opened up and the workers found the mummified bodies of the van Delben family stored inside the crypt. The bodies have since been removed and the mausoleum is currently used as a storage shed for the museum. No one knows where the mummified bodies are presently. They would have most probably been brought back to the Netherlands or buried in another cemetery in Jakarta to make way for the museum. Most people who visit the Taman Prasasti Museum would be intrigued by the sight of a memorial decorated with a macabre sight, a human skull pearched upon an upright spear. This uncanny memorial belongs to Pieter Elberfeld, a rebel who was brutally quartered by the Dutch government for high treason. Born in Java in the year 1663 to a German father and a Javanese mother, Pieter Elberfeld was one who clung to native ideas and customs, which subsequently led him to become an enthusiastic and daring patriot. He hated the Dutch and all connected with them and resolved on the extermination of every Dutchman from the soil of Java. When his father died, Pieter Elberfeld inherited a huge estate from his father. The VOC government, under the orders of then Governor-General Hendrick Zwaardecroon, exercised their superior authority by claiming a part of the estate. Incensed by their move, Elberfeld came up with a plan to kill the higher ranking officials of the VOC. Alas, before he could carry out his plan, his niece - who had fell in love with a Dutch official from the VOC - spilled the beans on her uncle. The government then caught him red-handed in the midst of a secret meeting and imprisoned him immediately. After hours of torture, Elberfeld confessed to his plans and was sentenced to death along with 19 of his slaves. The punishment was very cruel, even for the standards of that time. He was bound backward to a cross, decapitated and his body was cut in four pieces (and not quartered by horses as popularly depicted) The four pieces of his body were hung in the four quarters of the city and the similar punishment was administered to his accomplices. He was 59 years old at that time. Elberfeld's house, which was located outside the city then, was demolished and a schandmuur (wall of shame) was erected in its place. Elberfeld's head was set conspicuously upon a top of a pike to serve as a warning to the rest of Batavia. Over time, only the skull was left. It was then thickly plastered over to protect it from the influence of time and weather. Uik eene verfoeyelyke gedachtenise tegen den gestraften landverrader, Pieter Elberfeld, zal niemaud vermogen ter dezer plaatse to boumen, Simmeren, metselem, planten. iiu, of tenccurrige, dage. Batavia, den 22nd April, 1722. The street where Pieter Elberfeld's execution took place is now known as Jalan Pecah Kulit or "Ruptured Skin Street", a morbid name which best describes the history of the place. The Schandmuur, together with the skull on the iron pike, was then shifted to Taman Prasasti prior to the museum's opening. From the old photo of the Schandmuur and the recent one I took at Taman Prasasti, you could see that great measures were taken to remove the original wall from its original location to the museum. Apart from the Weeping Beauty, a second weeping lady statue can be found further in the park. Similar to the Weeping Beauty, this statue is sculptured in the Renaissance style too and there are also no visible inscriptions to tell us who the grave belongs to. The special thing about this tomb is the usage of corals in its fabrication. The weeping lady is seen leaning onto a rock mound made out of plastered rocks and corals. Can you spot them? This tomb is decorated with a broken doric column (like the ones at the entrance of Taman Prasasti) which reminded me of the ancient Greek architecture used for the Parthenon. A wreath is sculptured around the column to lend an air of prestige to the tomb. It was the final resting place for a lady named C.M van Os, which according to the inscription on the headstone, was the beloved wife of I. H. R. Goedhart. There lies a large, wide tomb not too far away from Dirk Varkevisser. This tomb is visibly much wider than any other tomb in the museum, and it has the distinct Greek alphabets A (Alpha) and Ω (Omega) inscribed on it. These are the first and last letters of the Greek alphabet. In the Book of Revelation, Jesus Christ refers to himself as the Alpha and the Omega, symbolizing the beginning and the end of all creation. There used to be a stone sphere on either side of the tomb, but as you can see in the picture below, the sphere on the right had been dislodged and now lies broken on the grave floor. The occupants (yes,there were 2 occupants) of the tomb must have been very pious Catholics indeed. Apart from the Alpha - Omega reference and the biblical verse in Latin, a religious symbol known as the Chi Rho Cross can also be found in the centre of the grave. The first two letters of Christ's name in Greek are X and P. In the Greek alphabet X is pronounced as Chi and P is pronounced as Rho, hence the name Chi Rho Cross. These two letters are usually inscribed as one over the other and enclosed within a circle, thus becoming both a cosmic and a solar symbol. Although not technically a cross, the Chi Rho invokes the crucifixion of Jesus as well as symbolizing his status as the Christ. Who was this A. Schultheiss? Schultheiss is a last name of German origin, which made sense for this gentleman since he was born in Bern, the capital of Switzerland. How was he related to the Lastdragers, and why is he being buried next to Mabisa instead of her husband? A real puzzle, indeed. 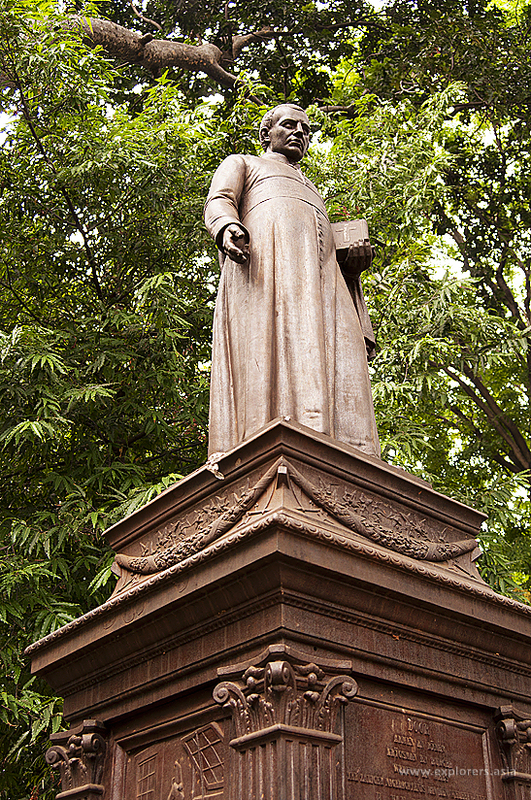 The tomb of H. van der Grinten, the head pastor of Batavia between 1847 - 1848, is also located in Taman Prasasti. Among the hundreds of gravestones, his benevolent statue cuts a fine figure. Father van der Grinten was the head pastor of the Catholic Church of Batavia - the first Catholic church in Batavia - located at the corner of Lapangan Banteng (a large open square situated in an European enclave and formerly known as Waterloopein). It was built over the former residence of the Dutch East Indies military commander General Hendrik Merkus de Kock (who later was made Baron for his triumph over Prince Diponegoro in the Java war). The church was inaugurated on 6 November 1829 and blessed by the head pastor at that time, Father L. Prinsen, as "The Church of Our Lady of Assumption". It measured 35 long by 17 metres wide, consisted of a large hall with rows of pillars on either side in the neo-gothic style, a common architectural style for churches at the time. Father van der Grinten lived in the priest's residence on the east wing of the church, while the sacristan lived in the west wing. The church stood until 9 April 1890 when it collapsed due to old age and poor maintenance. A new church was rebuilt in its place between 1891 and 1901 and today it stands as the Jakarta Cathedral. The church is acknowledged as an integral instrument for the spread of Roman Catholicism in Java during the 19th century. "IK BEN ALLES VOOR ALLEN GEWORDEN"
"ZYNE NAGEDACHTENIS ZAL NIET VERGAAN"
"EN ZIJN NAAM ZAL GENOEMD WORDEN"
"To the weak I became weak, that I might win the weak; I have become all things to all men, so that I may by all means save some." "His memory will not perish"
"And his name will be called"
In the northwestern corner of Taman Prasasti, I came across a magnificent tomb which could fit right into Transylvania like a glove. This gothic looking tomb belongs to Major General J. J. Perie, the Commander of the 1st Groote Militaire Afdeeling (literally the Great Military Division) in Java. During his illustrious career with the military, he was knighted and conferred with the 4th Order of the Militaire Willems-Orde (Military Order of William), the oldest and highest honour of the Kingdom of the Netherlands. This chivalric order was often presented to senior military officers in recognition of their feats of bravery on the battlefield and as a meritorious decoration. The receipient of several awards during his lifetime, Major General Perie was also awarded the Order of the Netherlands Lion. Major General Perie passed away in 1853 in Batavia. Due to his military rank and appointment, he was given a grand and honourable funeral and buried in Batavia itself. The high-relief hatchment on his tomb consists of a Galea (a Roman soldier's helmet), a Gladius (Roman sword) and a wreath. For Asians, it is very common to find larger tombs for the wealthy or people who were very important (take O.G Khouw for instance!). I guess the same can be said for the Dutch! From the size and grandeur of his grave, we could see the importance of Major General J. J. Perie's contributions to the Dutch East Indies government in Batavia. Apart from my main task of locating Olivia Raffles's tomb, the discovery of other tombs along the way and the interesting stories behind them were pretty gratifying for me. The many different tombs of Petamburan and Taman Prasasti were bewitching and I had much joy in discovering the tomb of O.G Khouw in the process. The many amazing stories behind each tomb were simply fascinating. I hope that you have enjoyed reading the memoir as much as I had enjoyed carrying out my research and writing it. As Greg Anderson once said “Focus on the journey, not the destination. Joy is found not in finishing an activity but in doing it. ", nothing can be further from the truth. As it stands, there are slightly over one thousand tombs in Taman Prasasti, each with their own story to tell. There are several more tombs of significance located in the area, like the tombs of Soe Hok Gie (an Chinese-Indonesian activist who fought for the rights of the Chinese community during the reign of presidents Sukarno and Suharto), Major General Johan Harmen Rudolf Khöler (a Dutch general who died in the Aceh war), Major General Andreas Victor Michiels (a highly successful Dutch general who triumphed over his native opponents in many skirmishes), Ms. Riboet (a hugely popular actress and recording artiste in the 1920s) and many, many others whom I am unable to mention in one breath alone. Perhaps one day I will return to document all these tombs and find out about the magnificent stories behind them. In my opinion, Taman Prasasti deserves a dedicated website of its own, documenting each individual tomb, their unique designs, their inscriptions and of course the back story of the deceased. 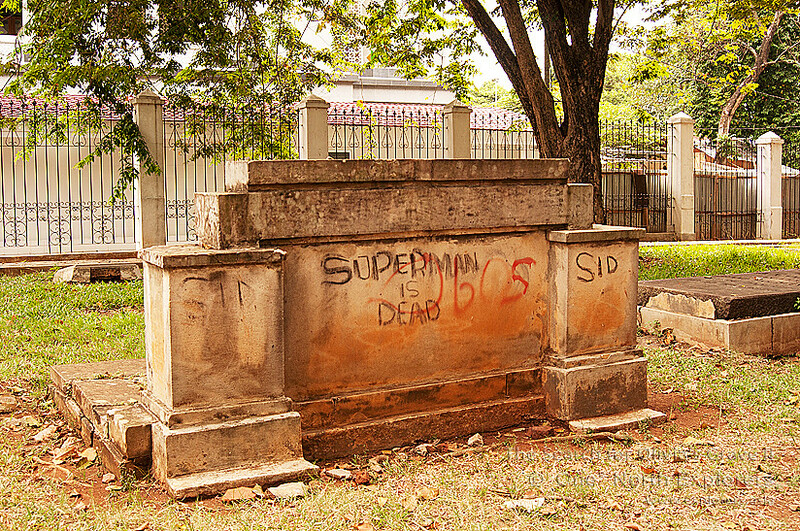 Just before I sign off, I'd like to draw everyone's attention to this - remember when I said that Taman Prasasti was in fact a museum, and that the bodies have been removed from the many colourful tombs during its renovation between 1975 and 1977? 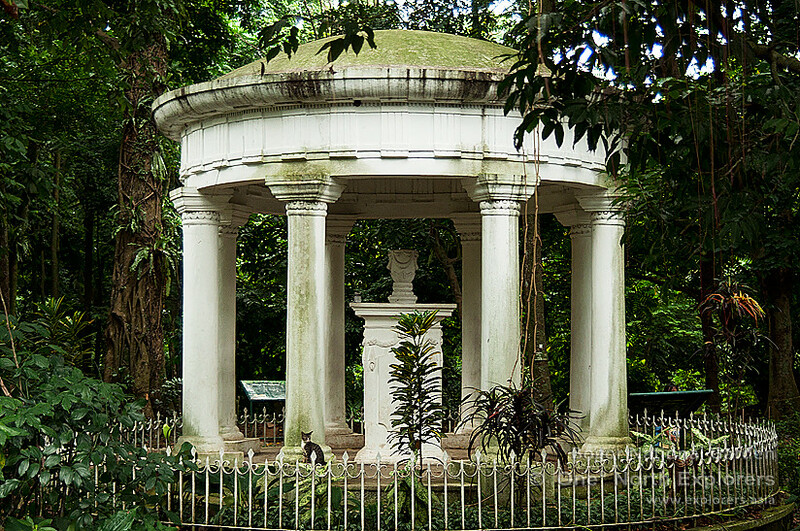 The big question is: while her tomb remains intact in Taman Prasasti, where did they relocate Olivia Raffles's body to? That's perhaps my cue to embark on another mission in the near future, to sniff out the location and final resting place of Olivia Raffles. Do join me again when I set foot for that. Until then, take care. A complete set of the author's photos taken in Taman Prasasti can be found here. Now thats a brilliant article. Very good coverage and cool photos. Well done !!! Dear Anonymous, thank you for your encouraging comments. More adventures to come in 2012!